This time last year, the Tulalip Heritage boys basketball team was (0-4) and in desperate search of a W. What a difference a year makes. Coach Bubba Fryberg has taken over head coaching duties for the boys team, assisted by Jared Parks and Marc Robinson, and together they’ve coached their team to a (3-0) start to the new season. Most impressive, all three Ws have come against 2B schools, a division higher than Heritage’s 1B classification. In their home opener, the Hawks hosted the Mount Vernon Christian Hurricanes on November 29th. Family and friends filled the bleachers to watch a very entertaining game. It couldn’t have started any better for the Hawks; they jumped out to an 11-0 lead and pushed that to 17-4 at the end of the 1st quarter. The ball was moving and every starter had scored points. Defensively, the Hawks weren’t allowing anything at the rim or in the paint. The Hurricanes were forced to settle with contested jumper after contested jumper. Over the 2nd and 3rd quarters, the ball continued to move well for the Hawks and the point distribution continued. Going into the final quarter the Hawks led 38-24. The 4th quarter saw a blowout turn into a grit and grind game. Suddenly, the Hurricanes couldn’t miss and the Hawks couldn’t buy a bucket. The lead dwindled by the minute and with only 21 seconds remaining the Hawks led 41-40 with Mt. Vernon Christian inbounding the ball. Tulalip played solid defense that resulted in a contested 3-pointer that missed, giving the Hawks the W in a front of a frenzied home crowd. Freshman Alonzo Jones-Smith led all Hawks with 12 points, Rodney Barber scored 10 points, and Paul Shay Jr. chipped in 7 points. Two days later, on December 1, Tulalip traveled to Darrington High School and won 45-37. The very next day they played again. This time taking on the La Conner Braves. In a heated game that saw multiple runs by both teams, the Hawks pulled out an impressive 49-45 victory. The (3-0) start is the first such undefeated start since the 2013-2014 team that made it all the way to State. 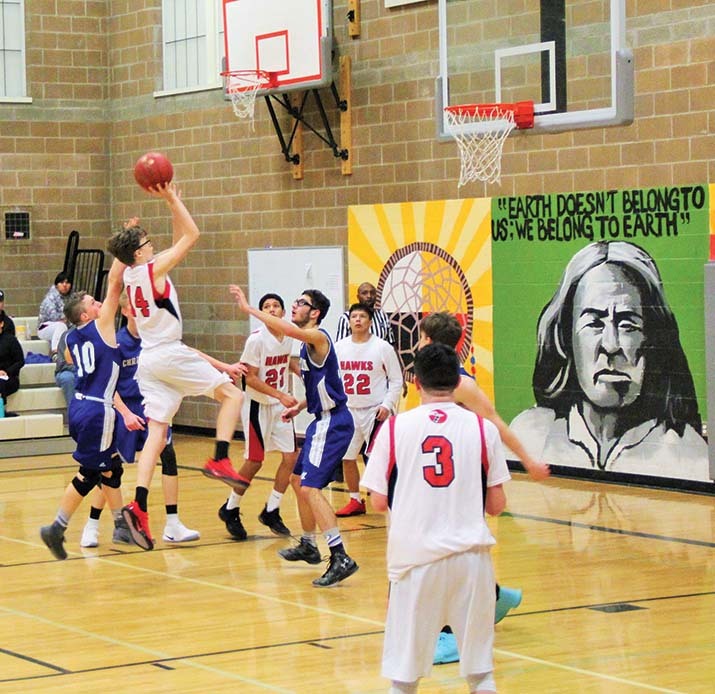 This entry was posted in Sports, Tulalip News and tagged Basketball, Hawks, Tulalip, Tulalip Heritage by Kim Kalliber. Bookmark the permalink.